Bidens, commonly called Tick Seed or Stick Tight are widely used in flower gardens around the world. The bright yellow flowers are borne in profusion right through the season. In warmer areas they flower right through winter into spring and summer. In cooler areas they will perform best in the warmer months. 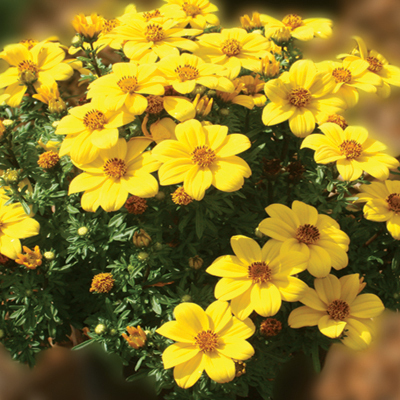 These Bidens are selected seedlings bred for their larger flower and abilities to flower into warmer weather. Bidens are widely spread natives from the open grasslands of the African, Asian and American tropics. As a native plant it has little merit. 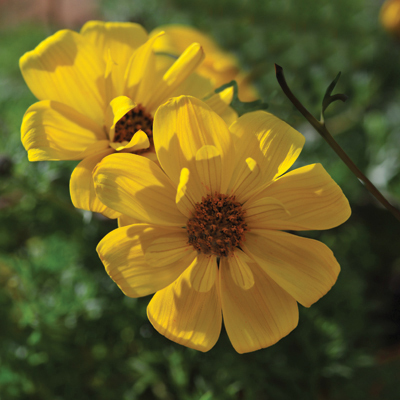 Breeders living in Switzerland were taken with plants of Bidens ferulifolia they saw growing in the US and Mexico. After collecting several superior strains they began breeding for compact habit, long flowering period and larger flower. There are several selections from this breeding. 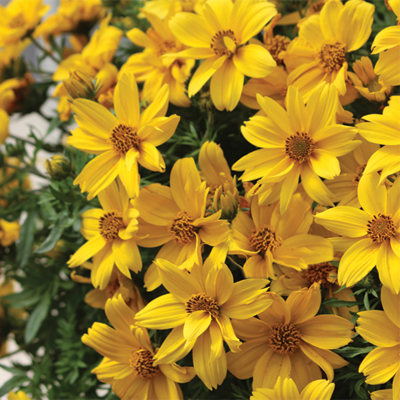 These Bidens are easy to grow and maintain. Plant them in full sun in any moderately fertile garden soil which will hold its moisture but be free draining. When your plant gets too tall or leggy prune back to where the leaves are still green and healthy. Afterwards use some well balanced fertilizer as a top dressing and water well.